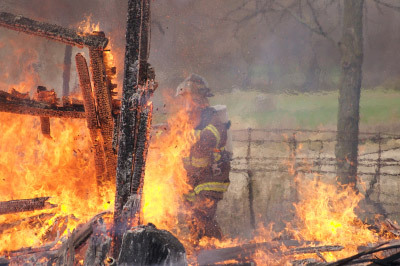 At a recent live fire training for my fire department, we burned three old dilapidated barns for a farmer," said Wade Moline. "As senior training officer, it is my responsibility to ensure that firefighters are being trained to meet state and federal standards." "For later critique of these training exercises I take pictures of everything I can and the photos are great to incorporate into Keynote and present to the firefighters so that they can see what they did right and what they did wrong as well as use them for classroom training." "After this training session, I downloaded all the pictures and as I was going through them, this one caught my eye. The firefighter may look like he is in the fire, and to some he looks like he actually is on fire, when he is really behind the barn pushing in the remains of a wall. The waves of heat rising from the fire appear to make a "glass" effect." Wade used a Canon EOS D60, shot at ISO 400, f 5.6, shutter speed 1/640, 176 mm.